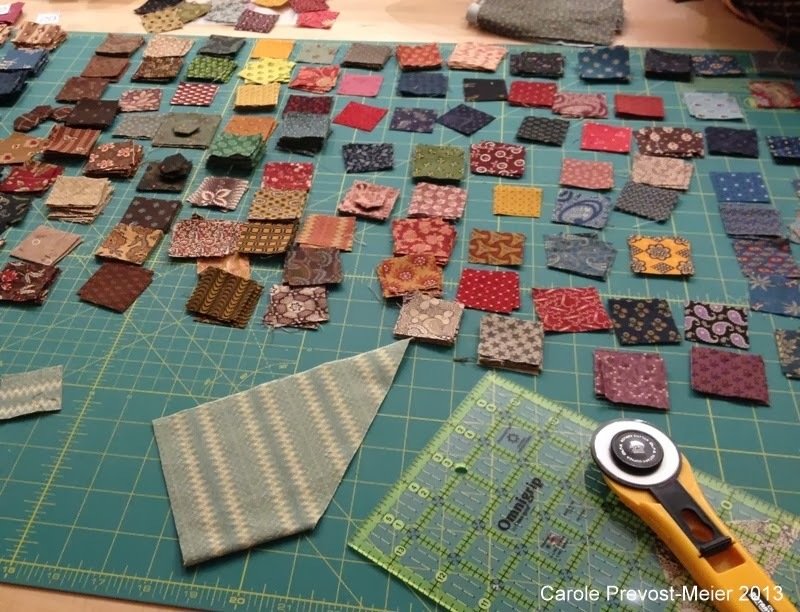 Quilting Adventures: Life, the universe and English Paper Piecing ....! 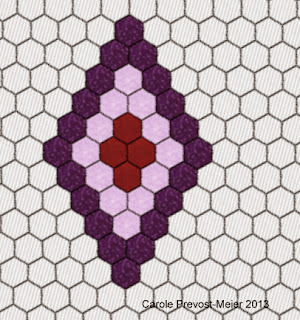 The hexagon quilt is awesome! It's great here. I'm I shorts and flip flops! How wonderful! You did a wonderful job. Not sure I would be ready to jump right into another. I love how your hexagons came out, that is a beautiful piece. I still need to finish my tree skirt. 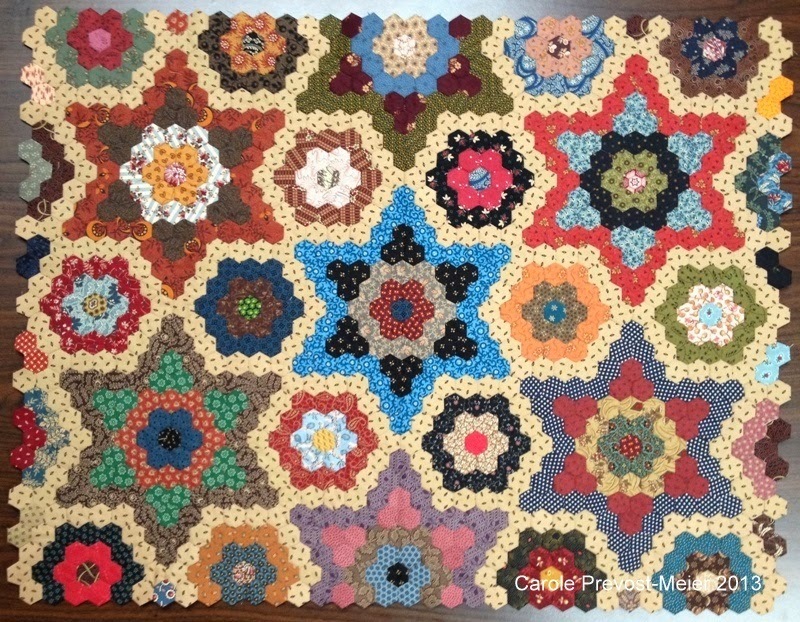 It started out as a quilt and then I realized I would never finish one that size, lol. I love doing them and someday I will start one for fun, to work on and use up scraps, without a deadline. We got rain but it was cool and breezy so we got out and enjoyed the day. I love how your hexie's came out. I saw this one in the magazine. If you can do the 1/2" hexie's then I should be able to as well? Gorgeous hexies! I love the idea of the setting you made. 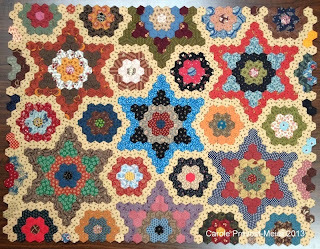 I worked on mine quite a bit over the weekend while watching a lot of TV - hope I get it done eventually - yours is stunning! Oh Wow -- that top is beautiful! What method do you use? EPP? Hand-stitching? I'm so impressed -- I'd love to start a GFG but I'm scared -- the people closest to me who've started them, never finish -- they're SO much work!!! Your quilt is wonderful. I use EQ as well and gave up on designing a quilt for my hexies there for the same reason you mentioned...didn't want to color every hexie. Working on Lucy Boston's Patchwork of the Crosses now. Half inch king size quilt, you have a lot of work ahead of you! p.s. love the colors you are going to use (and the finished hexie quilt at the beginning of the post).